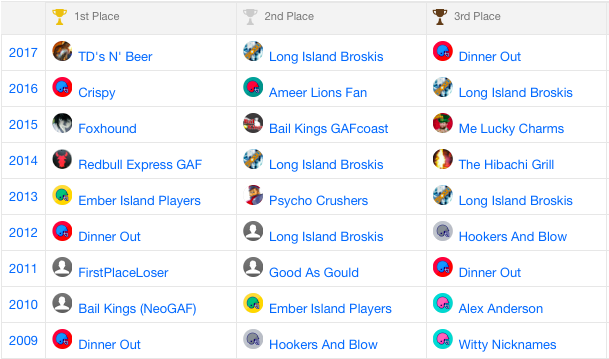 The longest-running fantasy football league for this community is back once again... now for its 10th season. While this is an established league with a great deal of history, it is not a dynasty league. Everyone starts from scratch with a clean slate just like all of the teams in the NFL. Filled with aspirations of being great until reality sets in and you realize you're playing for the Browns or the Bills. I'll maintain a wait list of those who have expressed interest in this OP for easy reference. Once we get a sense of how many slots need to be filled with newbies, the top names on the list will get PMed to pass along Email contacts so formal league invites can be issued. Furthermore, as always, this is a league with actual stakes. I mean, sure, some of these upstart ResetEra leagues are going to have bragging rights and glory at stake... but this league plays for more than that. We play for Amiibos / Loot Boxes / Gamerscore / Bitcoins / Random Substitute for Dollars that Isn't Dollars But is Actually Dollars. League dues last season were 65 of said unit of measurement up front with the top 4 teams making the money. Did I say money? That's just a metaphor. Yeah... metaphor. This season the league dues are being increased up to $75. The payout structure is still being deliberated but the top 4 places will all be paid. As always, previous players get priority. Invites were sent out recently but you can always check in to your Yahoo! fantasy profiles if yours got buried. If you can't find said invite and need it resent, PM me or the Commish immediately and we'll hook you up. This is a 16 team head-to-head, 0.5 PPR redraft league with a snake draft and weekly waiver priority determined by a team's outstanding FAAB budget (yes, we're a FAAB league now) with claim tiebreaks determined by team standings (the lower place team gets preference). 8 teams make the playoffs. Return yardage is credited to offensive players as well so be sure to factor that in to your drafting decisions. Payout structure will be disclosed below once it's finalized to reflect the buy-in increase from $65 to $75. As always, Week 14 is the ever critical MONEY WEEK where you make the money if you win and make nothing if you lose. Best of luck in the draft on Sunday night!